Gift of H.M. Government War Artists' Advisory Committee. A view along a long avenue of trees in winter, with groups of women pruning them and carrying away the dead wood. Three women stand in the foreground to right, pruning the nearest trees, two standing on white ladders. Another woman in foreground to left, carries a ladder away from the viewer. More women can be seen all along the avenue engaged in the same activity. Hills are visible in the distance beneath a cloudy sky. 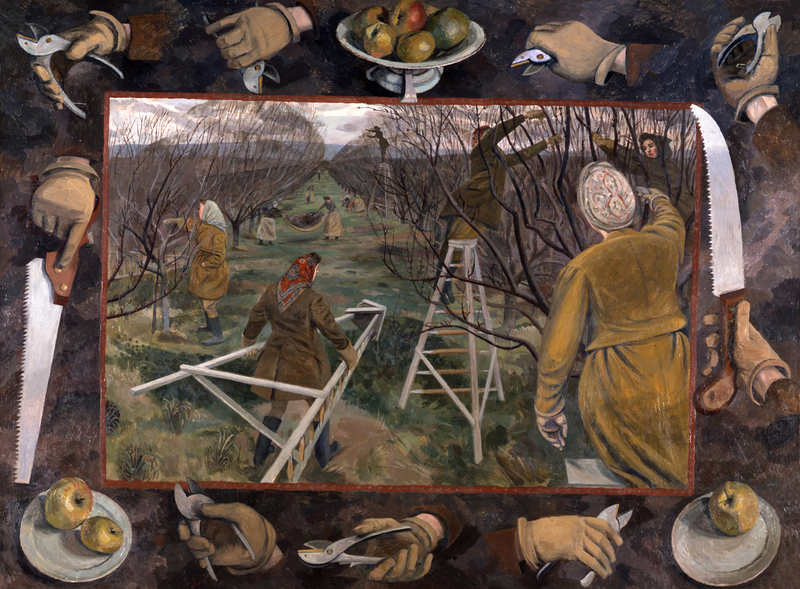 The scene is surrounded by a brown painted frame containing different motifs, including gloved hands each holding a pair of secateurs, a bowl of apples, a plate of apples, a gloved hand holding a small saw, and a gloved hand holding a serrated knife. East Malling Research Station in Kent was established in 1913 as a government owned establishment (privatised in 2007). It is the leading fruit research centre in the UK.